Beautiful You: My Mum's Birthday | Bath Shopping Haul & OOTD! My Mum's Birthday | Bath Shopping Haul & OOTD! Firstly, I am going to say that I am sorry this is late but I wanted to spend my mum's birthday with her and then last night I was so tired that I fell asleep before I could write this so I am doing it today instead! So as it was my mum's birthday yesterday and I am now home from uni for 3 and a bit weeks we thought that we would go to Bath for the day for some retail therapy and some good food! We got the train there around 10 and then went straight into shopping, I might have made a few cheeky purchases which I will show you guys; I also have one thing that I didn't buy in Bath but I wanted to include it anyway! I also took a picture of what I wore so I will start with an OOTD for you, I hope you like this blog post! One of the things that I bought that I am really excited for is this 'Start Getting Naked' set which all together costs £32. It includes a full size Naked Skin Foundation in the colour that matches you, a mini optical blurring brush and a travel size all nighter make-up setting spray! I have read so many amazing reviews of this foundation and I have been wanting to try it for ages so I will be testing it and give you my opinion on it soon! I was only talking to the girl who colour matched me about the full size version of the brush and how dense it is which always bodes well for applying foundation! 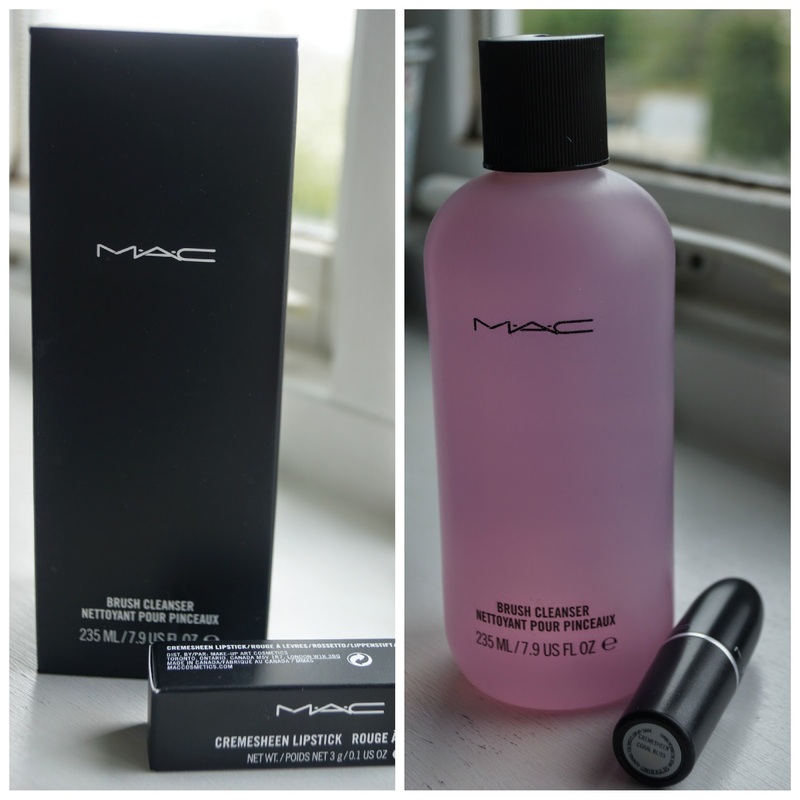 I then went into MAC and I finally managed to find their brush cleanser which has been out of stock in my local MAC for sooo long! I also bought Coral Bliss lipstick because as you all know this was the lip stick that I gave away for my 6 month blog birthday and I fell in love and I had to have it for myself! This phone case has been in my basket online for so so so long and when we went past Jack Wills I had to go in and get it because then I wouldn't have to pay for postage and I'm so glad I did! Some people will tell me off because it is a lot of money for a phone case but oh well, I love it! All these next items are clothes and I am going to apologise now for how awful the pictures are, I find it really hard to take pictures of clothes and make them look nice. However, I will definitely include most of these in an outfit of the day soon so that you can see them better! The first piece of clothing I got was this swing cami from Dorothy Perkins and this was an absolute bargain as there was a deal for 25% off but my code wasn't working but they took the money off anyway thankfully. It was originally £12 but as it had 25% off I paid £9 which I think is really good value for money! This next item is just a standard t-shirt from River Island for £16 and it just says 'No1 New York Boutique Paris' with rolled up sleeves. I had another one of these tops from River Island and I wear it all the time but it is green so you can't wear it with much so when I saw this I had to have it! I would recommend buying it in a size smaller than you are if you don't want it to be too oversized as they are big! Lastly, if you know me on twitter or personally then you will know that I am a lover of Kimonos and we saw this one reduced in Hollister for £24 so me and my sister went halves on it. It is just navy with lighter blue and white accents on it, I think it would look really nice with blue jeans and a white vest in the summer! This is what I wanted to show you but I didn't buy it in Bath, it is a Ted Baker make-up bag from John Lewis for £20 as they had 20%! It is mint green and fits all of my everyday make-up in there, which I was thinking of doing a blog post on so if you would like to see that then let me know in the comments! I think that is everything so I will wrap it up, sorry this blog post was a little picture heavy but I just wanted to show you everything that I got! If you have or have tried anything featured in this post then let me know in the comments how you got on, I would love to know! Again I am sorry this is late but better late than never right? I will see you again tomorrow as usually with something a little different feature someone special too! Happy Thursday! That UD set is such great value, might have to pick it up! Happy birthday to your mum! That lipstick is such a gorgeous color! !